This game was written for Christoph Tenzers PhD celebration. 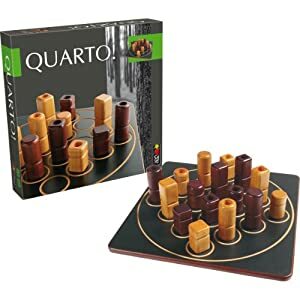 The original game is a wooden field with 16 distinct figures. Each figure has 4 properties: it is round/square, black/white, small/tall and marked/unmarked. The game is played by 2 people. A turn starts by player A selecting a figure, and player B placing that figure on the board. If a player can place a figure in such a way that one row/column/diagonale contains figures with a common distinguisher, that player wins. It's really a fun game! You should give it a try. For the PhD celebration, Chris had to play this game with a theme covering his PhD, hobbies and personal life. While in the original board game, the distinguishers are round/square, black/white, small/tall and marked/unmarked, the distinguishers in Chris version are: astronomy-related/not astronomy-related, a Person/not a Person, a Robot/ not a Robot, fictional/real. This computer version is an extremely simple implementation of a themable board. No checking for winners, etc. Just the board and the pieces.